Pictured: Johnny Iuzzini (ABC / Mark Bourdillion). That’s the way the cookie crumbles. ABC has cancelled the third season of The Great American Baking Show. 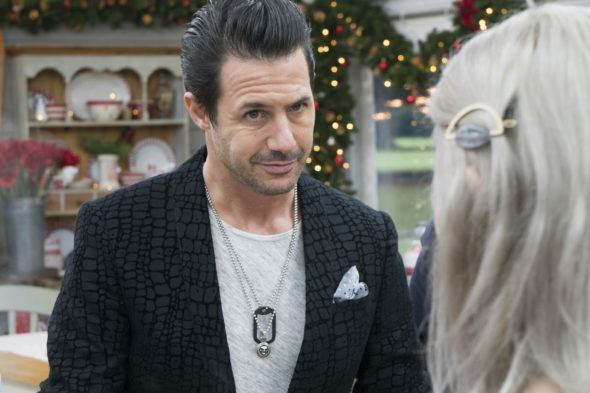 The Alphabet Network has reportedly pulled the cooking competition from its schedule and fired the last remaining original judge, Johnny Iuzzini, due to allegations of sexual misconduct unrelated to the series. The episodes scheduled for December 14th and 21st have been scrapped, leaving the December 7th two-hour premiere as the only season three episode to have aired. An ABC reality TV show competition The Great American Baking Show is a US adaptation of The Great British Bake Off. Formerly known as The Great Holiday Baking Show, the series features bakers from around the country going head to head in holiday-themed challenges and eliminations, with the goal of being crowned “America’s Best Amateur Baker.” This installment saw Paul Hollywood join as a judge, along with new host-judges Ayesha Curry and Anthony ‘Spice’ Adams. Claims against Iuzzini first surfaced days after Thanksgiving when Mic posted a story in which four former employees described allegations of sexual harassment and abuse while working under Iuzzini at a New York restaurant between 2009 and 2011. It followed up with a second report Tuesday in which four more women came forward with new allegations. Two of his accusers said management was aware of the allegations as early as 2004, and the other two claimed that Iuzzini abused his power and influence over female subordinates and associates. ABC added that episodes of The Great Christmas Light Fight and CMA Country Christmas will air in Great American Baking Show‘s 9 PM Thursday slot this week and next…. ABC has not addressed whether it will cancel or renew The Great American Baking Show TV series for season four and beyond. When we know more, you will too. What do you think? Did ABC do the right thing in cancelling the rest of The Great American Baking Show, season three? Sound off, in the comments. More about: ABC TV shows: canceled or renewed?, The Great American Baking Show, The Great American Baking Show: canceled or renewed?, The Great Christmas Light Fight, The Great Christmas Light Fight: canceled or renewed? I would love to see great American bake off come back on. We looked forward to it. Replace the chef and please bring it back. !